The final day of the Happiness Challenge has arrived. And while I may not be posting something every day that makes me happy until next August, I'm happy in knowing that the days, weeks and months ahead will be filled with a lot of great things. And I'm looking forward to all of them. Just over 24 hours until IT'S FOOTBALL TIME IN TENNESSEE!!!!!!!!!!!!!!!!!!!!!!!!!!!!!! By the time I go to bed tonight, college football season will have officially kicked off...and with an SEC game on ESPN! Forget that puny baseball thing. Just declare the season over and let's focus on the REAL sport! I love the fact that a work-out releases the same endorphins that an anti-depressant does. I may not always be eager to get to the Y and workout, but I always feel better afterward--not just physically, but mentally. Only four more days until it's football time in Tennessee!!!!!!!!!!!!!!!!! Cal can try all they want, but they will never equal or surpass the passion and sheer noise of the fans of the Southeastern Conference. That sad part is they think they even have a chance of equalling the experience of going to the greatest college football stadium on the planet with this puny little microphone stunt. Though I did find it interesting that Jonathan Hefney has given Cal some good bulletin board material. “We come from the South,” Hefney said. “We play tough football. Last year’s UT-Cal game certainly bolstered Hefney’s point. UT led 35-0 in Knoxville before winning 35-18. Hefney said he’s never seen a team wilt like the Golden Bears in his UT career. While browsing the book aisle in Wal-Mart the other day, I noticed the latest Elizabeth George novel, What Came Before He Shot Her, was out in paperback. And while I wasn't a huge fan of the book, I was still excited to see it. Because a new paperback publication often means a new hardcover novel is on the way. I picked up a copy of the book and flipped to the back and was greeted by an excerpt from her new "Inspector Thomas Lynley" (no mention of Havers?!? What the heck?!?) that was promised as "Coming soon..."
So, when I got home, I surfed to her web site, figuring details would be there. Nothing. Checked Amazon and after scrolling through pages of her works, still no mention of it. I finally had to check Wikipedia and got that the book is supposed to come out in 2008. 2008?!? And you tease me by only calling it a "Lynley novel" after what happened in the final pages of With No One as Witness?!? Come on! I need something here...some small tid-bit, some clue, some morsel to keep me going until the novel appears in bookstores and libraries. A couple of weeks ago (well, probably more like close to a month and a half ago), Rick and Bubba featured author Don Piper on their program. Piper is the author of the book 90 Minutes in Heaven, which I'd seen at various book stores and Wal-Mart but the book hadn't really jumped out or caught my interest. Honestly, I'd kind of dismissed it as one of those books that would take about dying, floating above the body, the white light, all those random cliches we've heard about near-death experiences. But then I heard Piper talk on Rick and Bubba and my interest was piqued. I got the book from the library and quickly read it. It's been about three weeks since I read it, but yet I find myself still going back to it, thinking about it and reflecting on it. For those of you who don't know, the book talks about Piper's experience from several years ago. Piper was driving back from a religious conference when his car was hit by a semi while crossing a bridge. Piper was pretty mangled in the wreck and pronounced dead at the scene. He was gone from this world for 90 minutes, during which time he went to heaven. In the book, he tries to put into words what he experienced there, but you can tell it's difficult for him. Not because he doesn't believe it, but because to describe the overwhelming experience and glory of being in heaven with our limited vocabulary in this level of existence is a bit difficult to do. During his time in heaven, a friend of Piper's went to the scene and felt the call to pray for him. The friend did, even singing a hymn over Piper's dead body. Suddenly, Piper says he was no longer in heaven, but back here on Earth. Now, here's the intersting part of the story. The book is about 15 or so chapters long and covers about 200 pages. Only two chapters and maybe a total of 30 pages tops is spent relating Piper's heaven experience. The rest of the book is spent talking about Piper's return to his Earth, his recovery from his severe injuries and it examines the question--why would I get to heaven and be ready to leave this world, only to be sent back to Earth to a broken body and a spirit that was discouraged and hurting? Piper spends a good bit of time describing what happened to him and the processes the surgeons and doctors had to use in order to attempt to restore a new sense of normal to his life. There are times reading about what Piper experience, including the almost overwhelming pain that no amount of drugs could numb, that had me cringing. But yet, as the story goes along, Piper slowly begins to realize he came back to Earth for a good reason. And he begins to embrace it and accept it. He never gets any "good" answer to the why bad things happens to good people question, but he does explore how out of this negative, there have come many positives in his life. And that he was sent back to Earth to help create God's kingdom in his own way. It makes me think about times in my life when things have looked bleak and I've wondered--God, why are you letting me go through this? Sometimes in my mind, I see God as Superman, able to swoop down from the sky and take care of all my problems for me. But from that I learn nothing and don't have experiences or struggles that help me. I know it's hard to think about it, but in life there are peaks and valleys....but most of life is lived between those. And it's how we live in those between times that I think defines who we are. Certainly, I've never had a valley quite as deep as Mr. Piper's but I've had a few. And I've had peaks as well, and reading the book we get to see some of Piper's. And all of that encourages me. And reading about Piper's experience of his few moments in heaven, it makes me want to get there all the more. I know that when God calls me home, that's where I'm going...and hearing what Piper relates about the experience, it sounds amazing. Even more amazing that I could ever imagine or describe here on Earth (though in my heaven, Tennessee beats Florida every time we play and Spurrier throws the visor a lot...I imagine this is probably not exactly how it is and once I get there, I won't care a lick about football, but it's still nice to imagine sometimes). And the book has stuck with me...I've thought a good bit about it since I read it and have reflected on it a lot in my quiet time. I don't believe it takes the place of Scripture in having truth in my life. That said, if you're looking for an interesting book, I highly recommend this one. Give it a try...you never know what you might take from it. Got my teeth cleaned today for the first time in...well, it's been way, way too long. I got all excited this morning when I saw the news that Kevin Smith would be directed an episode of Battlestar Galactica this season. Yeah, apparently the reports were a bit pre-mature. Smith will not be directed an episode this year due to "scheduling conflicts" according to the wife of executive-producer Ron Moore, Terry Moore. A month ago, when Ginger of Ginger Snaps announced the blogger meet-up picnic, I thought--man that is a great idea. As we got closer and closer to it and the temperature refused to drop below triple digits, I have to admit, I was beginning to wonder if the event would happen. Or if I'd attend. I love y'all but me plus over 100 degree heat...not always a good combination. Luckily, the heat dissipated a bit over the weekend down to the mid-90's. 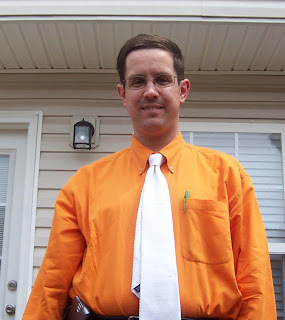 So, armed with my homemade orange Jell-O cake and directions from Google maps, I set out on my journey, wondering who I'd run into and if I'd get to put any new faces with blogs. 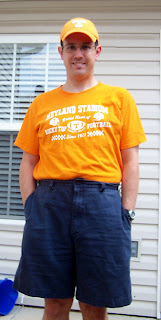 I also made it fairly easy for everyone there to identify me by wearing orange--both hat and shirt. 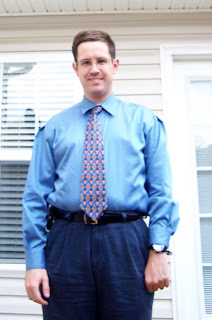 Scroll down if you want to see what I wore to the picnic yesterday (I know, I know...could I be any more ego gratifying? But this is my blog, doggone it!) Anyway, I decided to show up fashionably late, which is a nice way of saying after church I took a nap. I arrived to find a myriad of bloggers there. I'll admit I was on the look-out for familiar faces as I drove up. I had this odd vision driving up of walking up to some group of strangers, Jell-O cake in hand and being readily accepted but not realizing for serveral hours these weren't the people I was looking for, but instead some insidious cult that would try to brainwash me into believing that Steve Spurrier is a nice guy and I should somehow start pulling for the University of Florida. Thankfully, there was a sign indicating it was the group I was looking for and I saw some familiar faces...so all was well. I won't provide a second by second recap of the afternoon. I did get a chance to put some new faces with their blogs (it's always interesting to see how the actual person matches up with the image you've got in your head...sort of like when I first saw pictures of the stars of some of my favorite old radio shows and they didn't quite match the images in my mind), catch up with some old friends and get humiliated at kick-ball. First of all, I was having flashbacks to PE class when sides were picked, watching as all the cool kid are picked first. Thankfully I wasn't picked last, but I think part of that was my making a huge commotion and trying my best to look pitiful. And I thought our one run in the top of the first was pretty good for a just assembled kick-ball team. But like the Tampa Bay Devils Rays, I soon found we had no chance against the New York Yankees of kick-ball. Of course, it didn't help that I dropped an easy out early in the inning. (I am eternally grateful to Graceless in Love and Bad Bad Ivy for also dropping pop flies to help make me feel a bit better). But we had a good time and after an inning and a half we surrendered. They just had a better payroll than we did...and it showed. Anyway, after the sporting activity humiliation ended, it was time to catch up more. I did take a few pictures of people. I've put them in my FlickR feed and if you want to see them, you can go here and do that. If I've not labelled you or incorrectly labelled who you are, please drop me a line and let me know. I'll make sure to give you the proper credit. So, it was a fun afternoon. I understand we had some who missed the event due to the heat. It was hinted there will be future meet-ups and hopefully my prowess in kick-ball won't lead to my not being invited. Hopefully if you couldn't make it out to this one, we'll catch you at the next one...I plan to be there...well, unless UT is playing Florida and then I ain't leaving in front of my TV because, as we all know, the Vols need me. 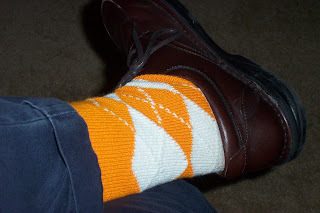 Kick-off to the UT season is just five short days from now and I'm more than ready. 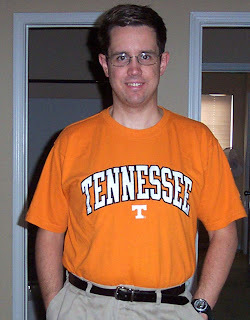 Every year, I've had my own personal ritual of outfitting myself in some type of UT colors or apparel for a couple of days leading up to first game of the year. It used to be the Thursday through Saturday but now thanks to my obsession love of UT sports and that being reflected in my wardrobe, I can now do the entire week leading up to kick-off. 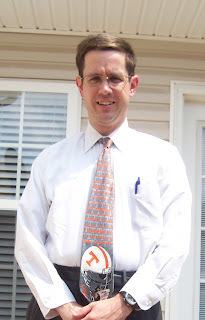 Deep down, I know Phillip Fulmer and the team are counting on me to show my spirit by doing this. We haven't lost a season opener since I started doing this, so you know it must be all about me. Want to know EXACTLY how long until kick-off of the greatest college football team in the land?!? Call me a slacker, I guess. I'm happy for a nice, restful weekend. I had a busy week and I think the heat wave in Nashville didn't help things either (too easy to get dehydrated). So, to have a nice weekend where I did get a lot of things accomplished but also had time to rest, relax, visit with family and friends and get in a nap or two is a good thing. And it does get me rested up for the wonderfulness that will be next weekend as UT kicks off football season. Football season begins one week from tomorrow. Real, honest-to-goodness football games that count and are meaningful. Yes, there have been the pre-season NFL games, but it's hard to work up the same passion and excitement for them. One week from tomorrow, the Vols take the field in Cal to battle the Golden Bears. I think one of the things that is the most exciting about this time of year is that every team is undefeated and every team has a shot a winning it all. Hope, expectation, dreams, surprises. No one is eliminated yet and everyone has a shot. Oh sure, there are some who are more likely to win than others, but anything can happen. And that's why I love the week leading up to the kick-off of football. Oops...I didn't post yesterday. Sometimes time just slips away from you. But hey, it's not because I didn't have anything to be happy about. In fact, the exact opposite. So, here are a few things that have made me happy the past two days. Catching up with a variety of friends the past couple of days. From a phone call to just hanging out and grabbing frosty adult beverages before a meeting, it's been nice to have some time to catch-up with friends and enjoy some good conversation. The other day, my mom took my niece to see a movie. They wanted me to go, but I couldn't make it to the theater in time due to work. I got a call from them as they got to the theater, asking me if I was going to make it. I'm sorry I couldn't make it, but it was nice that they both wanted me to be there and to enjoy the fun with them. I've got a new favorite team. Don't know the name of the team yet nor the exact schedule of games, but I do know that one of the players on it is one of my favorite people. My nephew has signed up for his first soccer team. 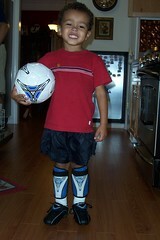 Yesterday he went and got his cleats, his soccer ball and his shin guards. As you can see here, he's very proud. I heard he was so excited about getting to start playing soccer he tried to wear his cleats to bed. So, I've got a new favorite player. And while I don't know as much about soccer as I should, I'll be heading out in a few weeks to watch his games on Saturday. See. Two things to look forward to on fall Saturday--my nephew's soccer games and UT football games. Of course, at least one of them I will know who the winner is before the game starts. My nephew is learning the fundamentals and rules of soccer, so they won't be keeping score. (That doesn't meant parents and proud uncles won't keep track of the zillion goals he will probably score...or more likely celebrate any goals that are scored by him as being bigger than winning the World Cup). I just hope he has as much fun playing the game as he did getting ready for it. A poll about what makes young people happy came back with some surprising results. The poll that was conducted on young adults between the ages of 13 and 24 found the thing that made respondents the most happy was their family. There were other things as well, but not a lot of them were materialistic things. Interestingly, the poll was conducted by MTV and the Associated Press. I found the poll results encouraging in a lot of ways and it gives me hope for the next generation. I think too often we get focused on the negatives associated with a minority of any given generation or group. It's like the focus on Adam Jones with the Titans. The majority of the guys on the team are probably what we'd term as "good guys" but there's one bad apple who seems to get the headlines. I think the same thing about kids today. When I covered high school athletics as the sports editor for a small-town paper, I found myself thinking about how I got to put young adults in the paper not for something negative, but something positive. Too often, if you see a high school or a college kid in the paper, it's for something he or she has done that isn't always the most positive thing in the world. But I was fortunate that I got to cover kids who were playing sports, participating in school activities, etc. It wasn't earth-shattering and it wasn't scandal ridden. But it did help remind that a majority of young people out there today are "good." Sometimes we just need a reminder of that. ...is what I wished they'd shown in this episode. Instead, we got a muddled mess of an episode that alternated between dull and mind-numbingly dull. It's not looking hopeful that this one is going to stay in my TV watching rotation too much longer. I think the big issue the show is facing is that it's struggling to find an identity. Does it want to have the same kind of self-deprecating humor that worked so well on Buffy, Angel and Firefly or does it want to play up the camp factor like Xena or Hercules or does it want to be a serious re-imagining of a campy idea from the past like Battlestar Galactica? Or is it trying to be all three at once and failing miserably on every account? I think the answer is more along the lines of the fourth choice. You can see this show struggling with its identity in every scene. The thing with having the self-deprecating thing is the comments have to be a)funny and b)kind of insightful. And they're not doing that here. Flash would do well to look at Buffy's first season, when there were a lot of jokes and taking the mustard out of the old cliches of the genre, but it was all done to help us understand who the characters are and to set-up storylines and character arcs for the future. Here is feels like we're getting a few random jokes thrown in because, golly, that sure worked well on Buffy and everyone seems to like that. Part of where the show also suffers is that the two plotlines couldn't be any more disjointed. After having every character on the show given a cursory introduction last week, the series wants and expects us to care about the characters and situations this week. And I can't muster up any feelings for than, other than the female cast members are all visually pleasing to look at. Last week, Ming sent a female bounty hunter to take out Flash and the story ended with her trapped in our world. This week, she's running around, creating havoc and doing...well, I'm not sure. Is she so devoted to Ming that she will still try and get the Imex back from Flash or bring him back to Mongo? Sure doesn't seem that way since she moves into his house and doesn't take a chance to go back to Mongo when she has it. Is she trying to escape her old life on Mongo? If so, then why not high-tail it out of town and away from where all the portals can open? And then in the end, why does she seemingly choose to join Flash's merry band of people? Will she help him find his dad? Or is she just there to be the wacky, female-Worf wannabe of the show? It's all terribly, terribly confusing. Meanwhile, over on Mongo, we're trying to establish that Ming is evil. But we're doing it in the least interesting way possible. I imagine when John Ralston got the role of Ming, he thought it might be...well, fun. In that way that Baltar on the original Battlestar Galactica was fun. But instead, we've got Ming the glorioius b*****d on this show. So, we capture a guy smuggling pure ice and he has to be executed. The only pure water on Mongo can be purchased from Ming. I am assuming this is how he hangs onto power. But then Aura asks him to save the guy because, hey, he was helping save his daughter. So, Ming helps the daughter but still kills dad. I suppose we're supposed to feel outraged or go--man, that Ming is one bad dude in this scene. All I could go was--gee, Ming is a really, really boring villain. The thing with a good villian is he has to be absolutely convinced that he's the hero of the show and I don't get that feeling from Ming. To go back to the new BSG, if you went up and talked to Baltar, he'd tell you that everything he's done is for a good reason and even though we may be horrified at it, we can sort of see the guy's point. Not so much here with Ming. Instead it seems he wants to show off just how "evil" he can really be...or make sure Aura never asks a favor of him again. And then there's the whole--sending a bounty-hunter to get the bounty-hunter back. I still don't quite get why Baraya is so important they have to bring her back. So, unlike last week, when I was disappointed but had hope, this week I come away disappointed and wondering if I should even bother with the next episode. It may improve and they may be working out some kinks in these early episodes. Or these may be an indicator of things to come. I just can't be sure and I'm not sure the show has done enough to make me really concerned if I see it or miss it. Today, I stopped by a couple of stores to check the clearance sales and found some good bargains. I was able to stock up and should be good to make it until next summer. I saved enough so I could splurge four dollars on a water bottle with a re-freezable ice center to use while I'm spinning. The Titans came back to beat the Patriots! I know it's only the pre-season, but I despise the Patriots and their coach. So, any time we can beat them, that's a good thing. 6:55 p.m. (CST) - It's the second pre-season game of the year for the Titans and the first pre-season game of the year for Vince Young....well, that is assuming he stayed at the hotel like he was supposed to. I'm looking forward to seeing Vince in action this week...and heaven knows if there was something that last week's game showed, it's that we need him. 6:58 p.m. - Have I mentioned that I'd like to see the Titans beat the stuffing out of New England? I hate Bill Belachick. I'm still annoyed at his complete lack of class in the regular season finale last year. He's a classless jerk and I hope we beat, beat, beat them. Yes, I know, it's pre-season and it doesn't matter, but I want to wipe that self-confident smirk off his face. I think I despise Belachick as much as I hate Spurrier and the entire Cowboys organization. 7:01 p.m. Ohhhh...football in the rain! Gotta love that! 7:06 p.m. - We've won the toss....let's run it back for a TD right now. 7:11 p.m. - Vince slips on third and three....ugh! First series is three and out. Hmmmmmmm, not good. 7:12 p.m. - On defense now...we'll see if last week was a fluke or not. 7:17 p.m - Vanderbilt commercial for Nashville night....let me see--go to a Vandy game vs Richmond or watch THE college powerhouse team in the state play vs Cal on national TV....yeah, not really a choice there. 7:28 p.m. - Jeez...tons of commericals. No more than last year, I'm sure..I'd just forgot about many breaks for commercials there are in games. 7:30 p.m. - New drive on offense....and we fumble it away. Ugh! Looks like Ahmad Hall should be putting in his application with UPS. 7: 35 p.m. - And the Patriots just run it down our throats for a TD. Of course, we gave them a gift with our THIRD freakin' offsides penalty in our third defensive series. 7:39 p.m. - Good run back by Michael Griffin. Pac-Man who? 7:42 p.m. - Well, at least we moved the ball a little bit before we had to punt it away. On third-and-long as Vince started to run, anyone else feel a bit of panic in relation to the Madden curse? 7:56 p.m. - Long first quarter finally winds to a close. And the Titans have looked not so impressive. Defense has had some good plays, but given up a few too many big plays and made some mental mistakes. And the offense has looked stop and start. 8:20 p.m. - Another interception by the defense. Good job. And we follow it up with yet another mis-fire on offense. 8:22 p.m. - Vince gets hit hard by Rodney Harrison. Could somebody please think about blocking him next time?!? 8:26 p.m. - Backing up why I hate Belacick--he's still got Tom Brady in the game. I hope Brady gets sacked! 8:45 p.m. - Huge play by Bo Scaffe making something out of nothing. All the way down inside the five....but Vince is at the 35 and down. Whew..he's back up. 8:46 p.m. - Chris Henry gets half-way to the end zone.....and now 2nd and 1...VY tries to sneak in...and gets no where. Titans forced to call timeout because the Pats are being punks...gee, who'd've figured?!? 8:49 p.m. - And Vince is stopped at the goal line on 4th down! 8: 51 p.m. - 17-7 New England at the half. Good defensive effort in the first half. Outside of one great play on offense in the first half, we have done exactly nothing. Here's a bad stat for you folks--the Titans have gone six pre-season quarters without a touchdown. That is not good news. 8: 52 p.m. - Fisher says the defense isn't blitzing but getting the pressure on Brady. That is good news. And with halftime here and getting ready for massive substitutions, I am going to wrap-up the live blogging. My niece's first day of kindergarten was yesterday. Former Star Trek-writer and executive producer of Voyager and then Enterprise, Brannon Braga is kind of a lightning rod of controversy when it comes to his tenure on Star Trek. Some say he did a good job, others firmly place the blame of the (apparent) failure of Enterprise and the moth-balling of the Trek franchise at his doorstep. Braga came under a lot of fire for this series finale for Enterprise, "These Are The Voyages..." A lot of fans (this one included) felt the send off wasn't exactly all it could or should have been, esp. given that Enterprise had turned a corner in season four and was actually delivering on the promise and premise established in season one. In a story on TrekToday, Braga made some comments about the final episode and the controversial decision to kill off Commander "Trip" Tucker. (A decision the books have since ret-conned and spun in a new and more interesting way). Asked if he had any regrets, Braga replied, "I honestly have to say that creatively probably nothing" but admitted that he wasn't happy with "These Are the Voyages..." after it aired. "The final episode was very controversial," he observed. "What we were trying to do was send a valentine to all the Star Trek shows. Enterprise just happened to be the show on at the time...I don’t know if it fully delivered and it really pissed off the cast." Braga said that he was not sorry that he killed off Trip Tucker, whom he claimed "was always my favorite character" on Enterprise. "I just wanted to kill him," he said. "We wanted to do something that had emotional impact and had consequences which is something we were never allowed to do." He believes that if Manny Coto had been a producer from the beginning, the show might have been better. Interesting comments to hear from Braga now. If you watch Trek and follow his evolution as a writer, he did have some good ideas in the beginning. He wrote a lot of episodes with Ron Moore, including the series finale of Next Gen and the first two Next Gen movies. He then went on to hack off Ron Moore when Moore went to work on Voyager, leading to Moore's leaving the writing staff after writing only one episode. And I think one thing that Braga did get right here--if Enterprise had been run by Manny Coto from the beginning it would have been better. Coto came in and brought in some new energy and ideas to the show, as well as a genuine affection and respect for the history of the Trek universe--esp. the original series. Being the book-a-holic I am, I use the library...a lot. So, one things that makes me happy is when I visit a bookstore, find a couple of books I want to read and remember a title or author long enough to get home and put them on reserve. And if the books come in quickly enough, it's almost like I gave into the impulse buy and get to start reading them right away. I know, I know....I've said many times before there must be some 12-step program for this addiction of mine...but if it makes me happy, can it really be that bad?!? The other day Tish tagged me to take part in the Face Behind the Blog Meme. 1. Post a short blog article that includes a photograph (or a series of photos) showing the face behind your blog. If you already show a photo somewhere on your site, then make your post more interesting by choosing a photo that’s not currently online. 2. Include links to other people who have displayed a photo. 3. Link back to the original post. 4. Tag as many others as you like. So, let me see...who do I want to tag? I'm going to go with: Logtar, Chuck, Becky, Katie, Sarah Ashlee, Teresa, and Karen R.
Getting to have dinner at Toots with my family is always enjoyable, though they had us packed into a tiny little table tonight. And then, on my way home I decided to indulge even more and stopped to get a cherry Icee..haven't had one in years. Yes, I will be spinning a bit harder tomorrow and may do a few extra laps...but sometimes these little indulgences are worth it. I don't have any kids, but there's still a bit of excitement this time of year with it being back-to-school time. A big part of that is that back-to-school time signals that football is returning and, as I've said many times before, that makes me happy. Also, back in the day before there was cable (yes, there was such a time...) the start of school also meant that the long summer repeat season was slowly coming to an end. (I can still recall at a young age, tuning into the summer cliffhanger to Webster and not yet understanding the concept of a season cliffhanger. One week, Webster's uncle wants to adopt him away from Ma'am and George and the next week, it's back to wacky hi-jinks as usual....terribly confusing). Growing up, I recall there was a bit of excitement about going back to school. (Yes, I guess I was a bit of a geek...big shock, huh?) Growing up an Air Force family, we often moved in the middle of the summer and the first day of school was a chance to meet other kids my age who didn't live nearby. I went to a variety of schools growing up in a variety of places and I always remember being both excited and nervous about the first day of school--esp. when I was going to school in a new place. In years we didn't move, there was the excitement of a new year and seeing old friends again. I was in Wal-Mart last week and made the mistake of getting in the general vicinity of school supplies. People were swarming all over them, lists in hand. I recall those vital decisions you had to make when it came to school supplies--which Trapper Keeper would I get? Which folders did I want? What kind of backpack? What color should the backpack be? And, of course, the greatest question of all--which lunchbox should I get? This was a vital decision because this would be something you carried with you all year long. So, getting the right lunch box wasn't something you could just do on impulse. You had to think about it--what would it say about me and who I was? I do recall I had several Star Wars lunchboxes growing up....as did a lot of of the other guys in my classes. I also recall the whole which was better--the metal or the plastic lunchboxes debate. 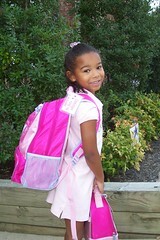 And now, here I am years later and watching as my niece gets ready to go to her first few days of kindergarten. She's excited about it and I'm glad that she seems to like learning right now. Last week, she had me be the teacher and give her school tasks to do in preparation for going to school. I gave her a few simple math problems and got her to write her ABCs and some words out. And I tried to recall what it was like when I went to kindergarten all those many years ago (you know, back when we rode to school in our Model T's). Thinking about all of that--that's my happiness for today. Handbell practice started back tonight. And while I am extremely rusty, it was nice to get back into the swing of things. The NFL Network has got to be annoyed. I'm pretty sure one of the main reasons they decided to send a crew to televise last night's pre-season game of the Titans vs the Redskins was the chance to feature Vince "I'm on the cover of Madden 2008" Young on national TV. And what does Vince go and do--violate team rules and get himself suspended for the game. I bet that wiped out a ton of the pre-show prep the two announces for NFL Network had done, all about Vince Young. It also lead to us seeing just how much the team needs Vince Young this year and how I am crossing my fingers, toes and anything else I can to make sure Vince avoids the Madden cover curse. Anyway, not a great game...but then again, what pre-season game is a great game? I guess the good news is the defenses on both sides looked good. It's too early to make any definitive statements...but I bet this will be a much different game when these two teams meet in the Super Bowl in February. Thanks for the FX Rescue Me site, I knew before I watched the episode what the fate of baby Gavin would be. And while I'm not sure about the decision to give the baby to Sheila (seems like you're trading one version of crazy for another here), I love the fall-out this decision had on the show. First, the fight with Janet, which we saw in the previews. But the most fascinating part of the show was watching Tommy's ghosts give up on him and leave him. The entire first act of this one was some of the most dramatic and intense we've seen from Rescue Me all year. Watching Tommy's desperation to get into the bedroom to save his ghosts as well as his breakdown on the floor as they all screamed in agony was superb. Something else that fascinated me about this--Tommy convinces himself that he has to hit the bottle to knock himself out and drown out the screams of the ghosts in the fire. A superb performance by Dennis Leary here and I imagine this will be in the running for his Emmy submission next year. Meanwhile, down at the firehouse, the guys are still acting like teenage boys. Here's something I noticed--the only guy at the station acting with any sense of maturity is the new probie Sean. Seeing him show genuine concern for Tommy and offering to be a friend, while all the other guys acted like fools and gossiped about what harm had befallen Tommy was interesting. Things should get interesting from here. I can't see Janet letting Sheila keep the baby. And if Tommy isn't the father, what right does he have to hand the baby over to Sheila? Personally, I think there's a huge crossover just waiting to happen here--Janet or Tommy could hire Patty Hewes from Damages to be his or her lawyers. How cool would that be? Flash Gordon's first episode suffers a lot from "pilot-itis." It throws everything and the kitchen sink into the episode. In the course of 90 minutes, we meet all the characters who will appear in the eventual opening credits and set up the entire situation and story arc. And it all feels so rushed that we never have any time to build any sense of connection or interest in the characters. Oh sure, all the players look pretty, but beyond that there's not much else. So, we find out that Flash's dad vanished earlier in his life, left him behind some kind of secret databank that Ming wants and that there are portal from our world to Mongo. Oh and we also set up at least two or three love triangles. Ask yourself this-did Dale's fiancee serve any other purpose in the story other than to be a potential love triangle? Couldn't we have left him out until the next episode and had Dale say--oh I'm engaged. Then we meet him next week after we've had some time to want to root for Dale and Flash to be together and build some chemistry between these two. And I also have to wonder at what point we'll find out the portals can go to other worlds. Otherwise if it's just a trip from Earth to Mongo and vice-versa, that is going to get old fast. It also didn't help that the script was a bit predictable. Gee, could they have telegraphed more that Princess Aura wasn't exactly who she claimed. As if it weren't obvious enough, we had Dale saying "Gee, she's not all she appears Flash," while Flash doesn't listen. Until it's too late and she comes to steal the IMEX (I kept thinking they were trying to find the IMAX theater in town to catch a movie....not good). And here's another thing--so, Ming is the ruler of Mongo and he's a bad guy. Why? Because he's got the good water and all the other water on Mongo is bad. Yeah, not exactly the greatest motivation for a bad guy.....of course, as I said before, we get such a touch and go couple of scenes with Ming that it's hard to really care that much either way. He's a bad guy because the script says he is....and there's not much more to it than that. That said, I think this series has potential. Hopefully the next few episodes will settle down and start to develop these characters a bit. (Don't even get me started on the female bounty hunter who comes to our world, gets trapped here and Flash allows her to drive off in a truck). I'll watch during the summer but come fall with all the new genre choices on the horizon, this one may fall of my radar. So, yesterday I talked about how there are two places I go to a regular basis where they know me by name. A third would be the Breaking Bread restaurant here in Smyrna. Every Saturday they have an all-you-can-eat good old fashioned Southern breakfast that is out of this world. I go on a pretty consistent basis--so much so that they know about the time I will come in, what I want to drink and how I want my eggs cooked. The food is great, the service is warm and friendly and it's just a great place to enjoy a good meal. I keep saying I've got to get by for lunch at some point...and I will make it one of these days. A good, satisfying meal to start off the weekend...and yes, I know that a lot of the food isn't on the lean and lively section of the menu, but you gotta live a little every once in a while! Also, I'm happy that my two favorite NFL teams kick-off the pre-season tonight. The Redskins journey to Nashville to take on the Titans. It will be great to see both teams back in action. nad it'd make me even happier if this could, somehow, be a preview of the Super Bowl. The theme song to Cheers tells us that sometimes it's nice to go "where everybody knows your name." It's a nice feeling to be recognized and greeted by people. It's one of the reasons I patronize the bank I do. I may not have as much money as Bill Gates, but the way everyone at my local branch greets me, knows my name and inquiries about how I'm doing and asks about my family--it's just a nice touch. And it doesn't really cost them anything, but it's gained them my business. (I used a certain other popular bank for years and felt like little more than a number and a huge pain in the you-know-what when I'd come into the branches...and not just those in my area, but really most of them I'd been to). Another place where I'm recognized is at the Y. Of course, some of you could say that it's because I go to the Y just about every day. But there's a couple of faces at the Smyrna Y who always take the time to greet me by name, even before I've scanned my card. And I guess I've become very regular in my attending spin classes because as one checked me in today, she automatically went for a spin pass-even though there were no classes scheduled again until tomorrow morning. Being greeted warmly and made to feel at home is a nice touch. It's not earth-shattering, but it's something that makes me happy. And it's something I hope I can take with me and use in my own life--greeting people with a smile and (hopefully) recalling their names to pass along a bit of happiness one step further into the world. The indoor pool being cool on a day when the mercury breaks 100 degrees. In the comments for my last post, I said that McKay's Used Books will soon be opening a store right here in Music City. Some of you asked--when and where? So, here's the information. The store is supposed to open in September at 5714 Charlotte Pike. The McKay's web site will probably tell us when the store opens as the time gets closer. While in Knoxville, I got to visit McKay's Used Books. I had a big list of CDs and books I was looking for--a couple of which I found. One CD that I found was unexpected. Looking through the comedy and spoken-word section for Rick and Bubba CDs, I found a copy of "The Best of the Vol Network, Volume 1." I picked it up and immediately knew that it had to join my huge CD collection. It's packed with highlights of big victories by the Vols (Miracle at South Bend, the Sugar Bowl in 85, the national championship season, the Fiesta Bowl) as well as big plays by quarter. It's also got the greatest marching band in the known universe playing most of the songs you'll hear when you see the Vols play in person. Listening to it has got me even more fired up for UT football. It's also got a lot of calls by John Ward, who will always be the Voice of the Vols to me. Bob Kessling just isn't quite as good at making the game come alive in your minds eye as Ward was. 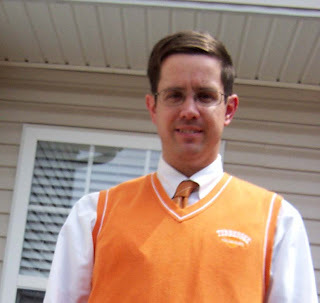 Plus, Ward was genuinely a fan who got excited in the booth when the Vols made huge plays or had a huge win. When you tuned in, you knew exactly where the Vols stood just by the tone in his voice. Unlike Bob who UT could be up at 100 or down by two with a minute to go and you just don't hear the enthusiasm or urgency. All I can say is, listening to that CD it's full of happy memories of big games and the people I shared the excitement of those big wins with. It's got me (even more) fired up for football season. I hope as my niece and nephew grow older they'll share or at least understand Uncle Michael's love of all things UT. Rick and Bubba being back on the radio in Nashville. Listening to them on the way into downtown makes the commute a little more bearable most days. Yesterday, I got to take part in worship services at two churches. In the morning I visited my old church home in Knoxville and last night I attended a special worship service at my new church home in Murfreesboro. These two church homes bring me a lot of happiness in my life. The one in Knoxville because I can always count on seeing old friends and church family members and being greeted warmly. (And it's not just me....I'd dare say anyone who visits will get a warm welcome.) I got lots of questions about if I was moving back permanently to Knoxville or if I had just come to town for a visit. Lots of hugs, lots of smiles and lots of catching up. And to see the church continuing to grow and change. I joked with some that it's hard to see the kids growing up at church, but deep down I'm happy to see it....and to see and hear about their journeys and growth. It still is difficult to believe that KB is considering her choices of colleges... And while it's good to see lots of familiar faces, it was also nice to see new faces that I didn't recognize. To see the church being active, vital and growing as a home to nurture the believers who gather there and to try and win new disciples....it's a wonderful answer to prayer. So, I went to the service, which was preceded by a dinner (we're Methodists and we firmly believe "if you feed them, they will come.") I had dinner, caught up with some friends and had fellowship with my church family. Then, it was time for the preaching....which was done from roof level in scissorlift. At one point, the pastor joked the roof would probably not be wobble back and forth as much as the scissorlift. We sang some old time hymns, heard a great message and then sang some more. As I reflected on both corporate worship experiences on the way home, I found myself thinking how blessed I am. I am part of two great church families, both of whom are Christ-centered and take the Great Commission seriously. They are active, vital and growing--not just in numbers of people who attend, but also in being out there, creating new followers and disciples in the community and world. I'm blessed to be part of two church families who have an age range from a couple of weeks old to well into the retirement years. Some of you may recall that I spent a bit of time a year and a half or so ago looking for the home church that I felt like God needed me to be at. I wanted to find a place that fit me as well as my old church did in Knoxville. And I've found it. And yesterday reminded me of that in a big way. And for all of that, I am truly happy...and thankful. Visiting my old church home in Knoxville was great this morning. I'm always surprised to see how much some of the kids have grown up since I've left. Great to see the church still doing great and today's sermon about family....very timely for me. Then, getting to catch up with old friends at lunch after the service was wonderful as well. As I got past Crossville, I tuned my radio to the official SportsTalk for UT. Nothing is better than hearing the guys discuss the only college football that matters to me in such great detail. A solid block of UT coverage, discussing the upcoming season and where are strengths and weaknesses are. No talk of hockey and saving a team, no talk of Adam Jones, no talk of Vandy having a chance this year (in fact, they laughed off Vandy or Kentucky going to a bowl game). Just good old fashioned Big Orange discussion. I'm blessed to have such a great, supportive family. I am constantly reminded of this. This side of the family loves to get together for celebrations and can be counted on to be supportive and there for each other in every way possible during the inevitable down times in everyone's lives. I have been looking forward to the reunion for several weeks now and I will be heading out the door to my old stomping grounds of Knoxville in a few hours. Tonight, we're having a wedding reception for a cousin who is getting married on a beach in Fiji in a few months. It's a Hawaiian themed reception and I've got my Hawaiian shirt ready. While I'll be nowhere near as cool as my niece and nephew, I will still try to have the island spirit in my apparel choice. Only 30 more days until it's Football Time in Tennessee!!!!!!!!!!!!!!!!!!!!!!!!!!! I've heard a bit of discussion the past few weeks that the current season of Rescue Me hasn't been developing quite as quickly as everyone would like. I think it's not so much that it's not developing a central arc to the season, so much as it's doing it without being obvious about it. The past few episodes have dealt with each of the guys in the firehouse losing their faith. Ever since the death of the Chief, the guys have been slowly spiralling down, almost as if without the central father-figure in the Chief, they're lost and adrift. We've also seen several of the guys have a general disconnect with the women in their lives and a growing sense of alienation. After watching this week's episode, that became more and more obvious, esp. when it comes to central character, Tommy Gavin. Tommy had had everything he believes in fundamentally shattered in the past few episodes. He seems to doubt that anyone loves him--unless they have some motive or want something in return from him. He's slowly spiralling down and it may only be a matter of time before he goes back to his old ways of drinking to cover the pain (in fact, I'm shocked we haven't seen him take a drink yet). But yet, he's trying to convince everyone and himself that it's all OK and that he's doing fine. We saw a huge example of how his mind is playing tricks on him last week as the words on the page kept morphing and changing in his perception. Now, if you've not seen Rescue Me yet, turn back now. Leaving us hanging for next week. One one hand, I think that while we did have the whole plot of attack on Janet last year that this is even far too dark a place to take Tommy Gavin. If they do go through with it (which I doubt they will), it makes Tommy too far beyond redemption for us to watch the show anymore. Doesn't it? I know that Rescue Me can be, at times, like a train wreck....it's horrible but yet you can't look away from it. I can see a solution to this and it seems fairly obvious. Lou talked about wanting kids. Tommy will take the baby to Lou to take care of. Because the other option on the table seems way too dark, even for this show. When I decided to take part in the Happiness Challenge this year, I challenged myself to try and come up with new and different things that made me happy and not just the blessings I'd thought about and discussed in previous years. Then I saw this picture again and I knew it was where I wanted to start. Pictured here are my favorite niece and nephew, who each get more amazing with each passing day. I got to hang out with them last night for dinner at Toots. My niece wasn't feeling so hot but I did get to help her put ketchup on her plate. My nephew wanted to play video games and even though his dad told him "no" he went to the court of appeals that is Uncle Michael and the grandparents. It was difficult, but I told him no. He amused me because after I told him I had no money for video games, he looked at my pocket and saw the lump from my keys and said, "But what is that?" He's getting wily in his old age (he will be four in a few months). And the picture here is a new one. But there's a story to it. 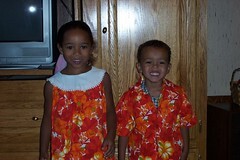 The Hawaiian clothing worn by the kids is a shirt I wore when my family lived in Hawaii and a dress my sister wore. They were trying them on to see if they'd fit for our family reunion this weekend. Friday evening is a tropics themed wedding reception for a cousin and his bride-to-be, who are getting married in Fiji. I think it's pretty cool that the kids will get to wear these outfits--and that my mom made them for my sister and I many, many years ago. I found Matthew Hurtt's column in this morning's Daily News Journal both interesting and damning. It's about the after-Sunday-worship crowd going out to eat. There is a growing problem largely unaddressed by the religious community. This problem causes very serious unintended consequences for the Christian witness, that ability for Christians to share the Gospel with non-Christians. Christian groups that routinely patronize restaurants after church on Sunday oftentimes behave in a manner that would lead servers and other restaurant attendees to believe Christians are rude, demanding and ungrateful people, which is definitely not an example Christians should strive to demonstrate. I feel that Christians may be acting this way unknowingly and that it simply needs to be brought to their attention. This statement is in no way a generalization of the actions of all Christians who go out to eat after church, but this is how a majority of servers and non-religiousrestaurant-goers see Christians. In fact, there are many servers who refuse to work on Sundays because they dislike the atmosphere created by large Christian groups. There are three major actions Christians subconsciously undertake when going out to eat: They exhibit a more demanding attitude than usual, they often leave a more noticeable presence, and they very rarely tip well. Churchgoers, from what I have seen firsthand and heard from servers, routinely demand perfect service with little regard for their server. They often exhibit rude and un-Christian behavior. The "holier than thou" attitude certainly does little to help the witness of Christians in restaurants. It's nothing new to hear that there is a group of people who claim to be Christians out there who follow the "do as I say, not as I do" theory. Or that there's a group that being a Christian extends only to living and acting that way when you're in the confines of a church for an hour or so a week (possibly more if you go on Wednesday evenings or are involved in other activities). Here's the thing--if you really and truly are a Christian, then it's not just a Sunday morning or a Wednesday evening thing. It's a 24/7 thing and it's something that calls us to be different and to act that way. And I agree with the point that we're not exactly creating fertile soil to plant seeds for Christ's kingdom by being rude or not tipping your server. I mean, being a Christian is supposed to be a radical change in your life--not just how you act when you think everyone is looking, but also how you act when no one is watching. I think in a lot of ways, the article points out that some are missing the whole point of Christianity. For me, it boils down to love the Lord your God with all your heart, mind and strength, accept that He gave His only son to die for our sins and that it's a gift we could never earn on our own and that we should "love everybody."